A moment of silence for divided families at Westbury Rally. 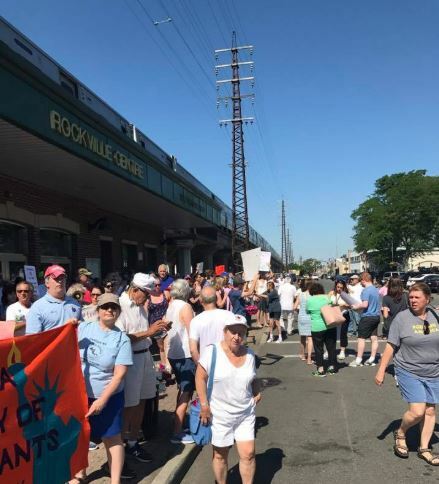 Rockville Centre at 10 AM this morning. 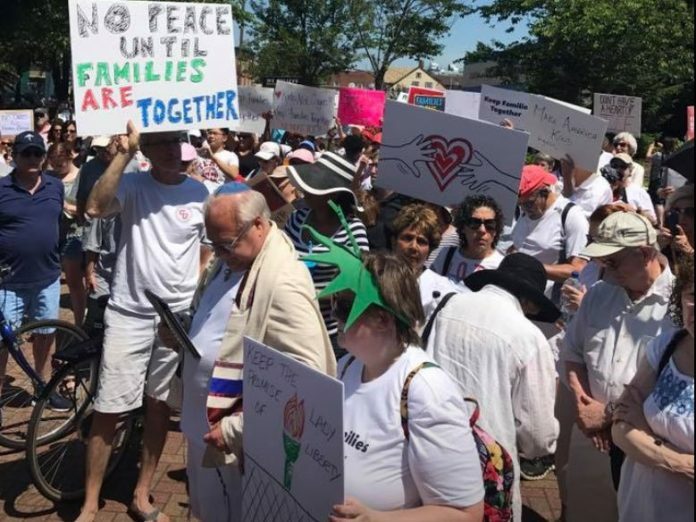 Rallies took place around Long Island on Saturday, June 30, in response to the Trump Administration’s “Zero Tolerance” policy of separating immigrant parents from children at the border. I attended three of the rallies already. 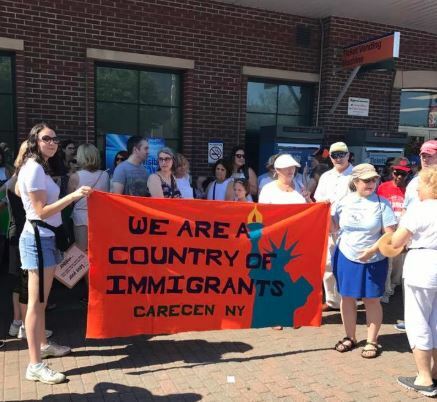 The final rally of the day is in East Meadow at the Nassau County Jail where Laura Curran still has not ended the practice of holding immigrants for arrest by ICE on non-judicial detainers. 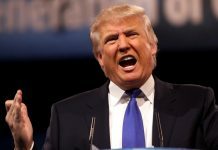 This article will be updated throughout the day as the rallies occur. 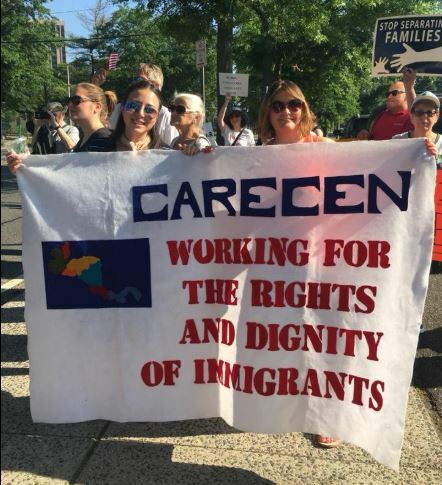 who had never been to an immigrants’ rights rally before said that they were incensed by what they saw on the news every night. 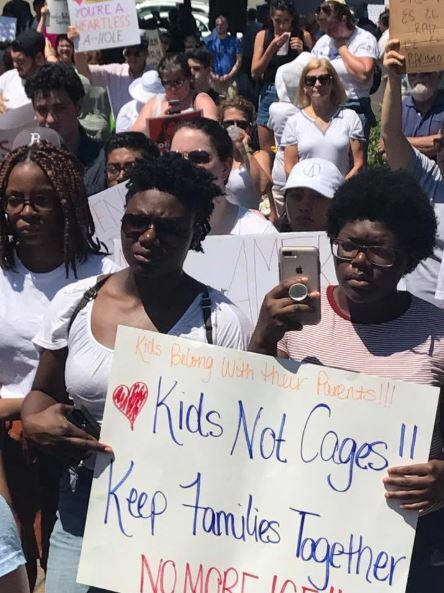 Speakers at the rally called for an end to family separation and for County Executive Laura Curran to end the cooperation of county agencies, like the county jail, with ICE. 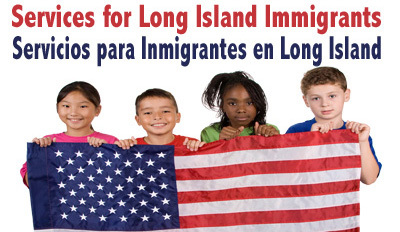 The principal feeders for the ICE deportation machine on Long Island are the law enforcement agencies of Nassau and Suffolk counties. At 11 AM rallies seemed to erupt all around Long Island. 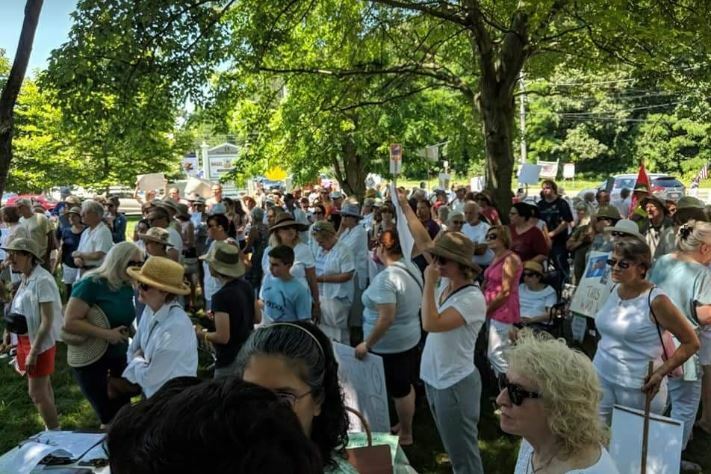 In the Sound-side community of East Setauket, hundreds gathered in the bucolic village to stand with refugees. Organizers were surprised by the size of the crowd. 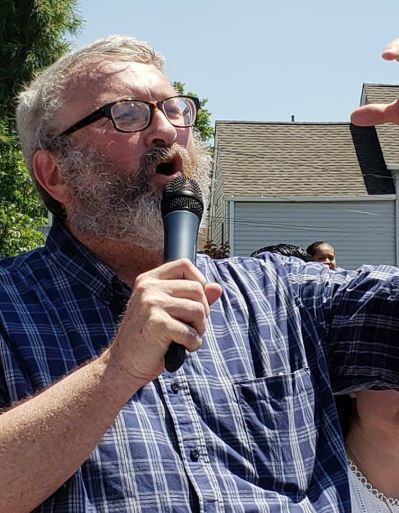 Pat Young speaking at the Westbury rally. In Westbury, a group of Westbury High School students organized a large rally on the village piazza. One organizer told me they expected dozens of people to attend. At least three hundred and fifty people actually showed up, spilling out of the piazza and on to the sidewalks of Post and Maple avenues. 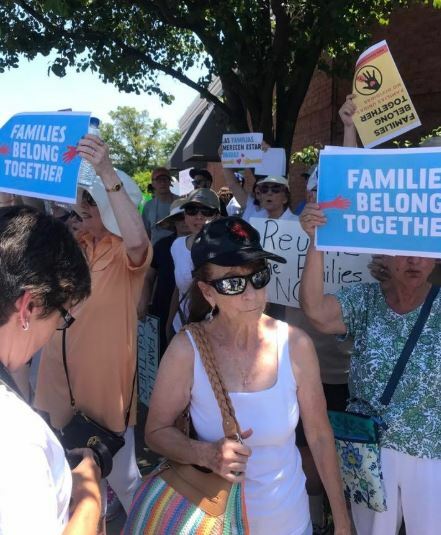 Speakers warned that family separation was only one prong of the attack on immigrants by the Trump administration. 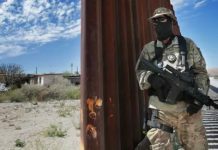 The Muslim Ban, the denial of asylum to those fleeing domestic violence and gangs, and the planned disqualification of women seeking benefits for their children were part of a broader assault on established policies. Children watching the rally from across the street made their own sign and hund it out the window in support of the Westbury rally. they honked their support for the protesters. From motorcyclists in full leathers to big rig drivers, there was a cacophony of horns honking. 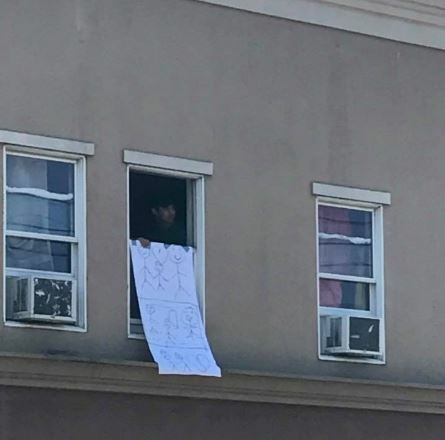 Children in a nearby apartment made a banner supporting the rally and hung it out of their window. Assemblyman Chuck Lavine was among the elected representatives at the rally. 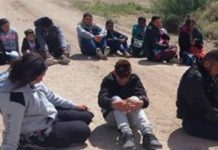 They got the message that the state and county have to step up to protect immigrants. 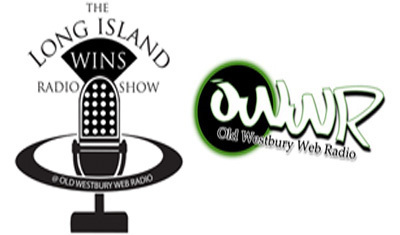 Westbury is one of the most diverse villages on Long Island and has well-established Central American and Muslim immigrant communities. 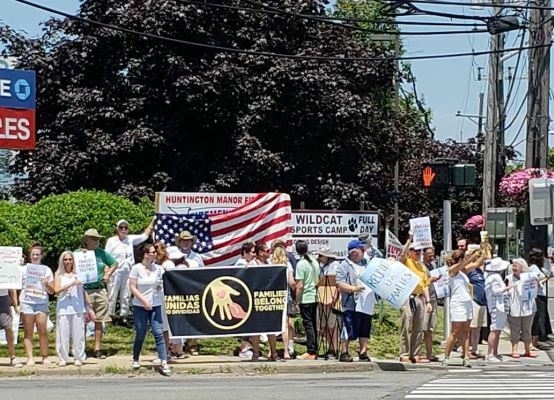 The Westbury rally kept growing during the morning, eventually reaching over 350 participants. High school students turned out not just young people but families, religious congregations and community groups in Westbury today. 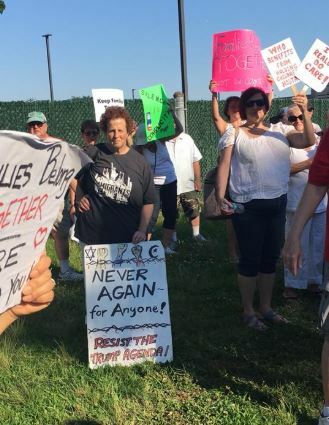 One of the largest rallies took place in the sweltering mid-day heat in Huntington. 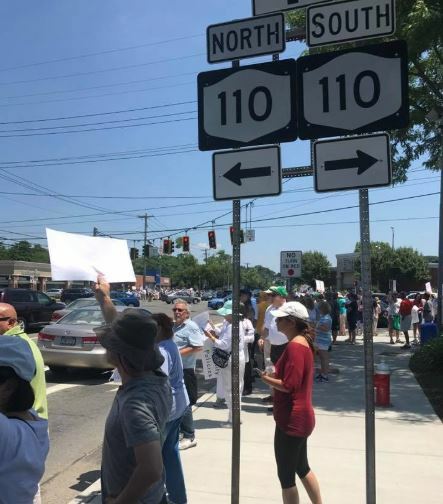 More than seven hundred people occupied all four corners of the intersection of Route 110 and Jericho Tpke., one of the busiest places on Long Island. 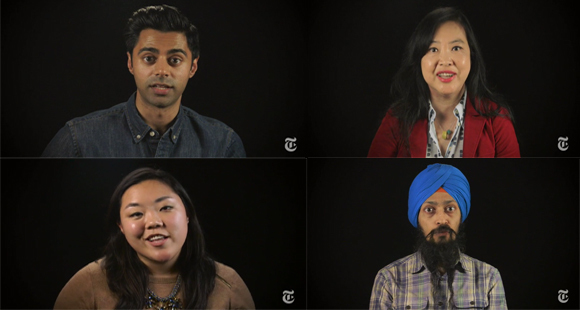 As the temperature climbed to 93 degrees, the crowd did not fade in the heat. Huntington saw one of the largest (and hottest) rallies. Rallies also took place on Lido Beach, Port Jefferson, Greenport and elsewhere around Long Island. 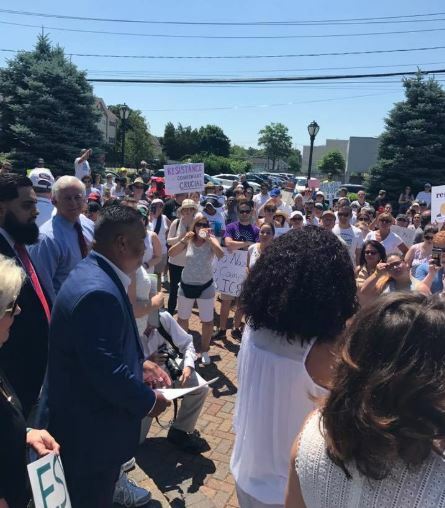 The final rally took place today at the Nassau County Jail in East Meadow at 5 PM and called for County Executive Laura Curran to end county law enforcement’s involvement with ICE. Cheryl Keshner outside Nassau County jail. Siomara Umana and Becca Reed at the East Meadow Rally.